It wasn’t a game of horseshoes, so being close wasn’t good enough for the University of Hawai’i basketball team in an 84-82 overtime loss at UC Santa Barbara on Thursday night at Santa Barbara, Calif.
A crowd of 2,317 at the Thunderdome watched the Gauchos avenge a one-point loss at Hawai’i three weeks ago. UCSB improved to 17-5 overall and remained tied for first place (with UC Davis) in the Big West Conference at 6-2. The Gauchos also improved to 10-0 at home this season. The Rainbow Warriors dropped to 13-7 overall and are now in sixth place in the Big West at 4-3. 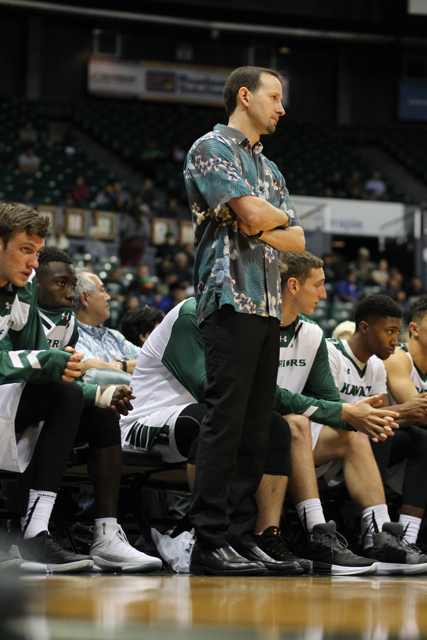 It is also the first time this season that Hawai’i lost back-to-back games. The Warriors trailed 36-30 at halftime, and were down by nine (59-50) with less than eight minutes remaining in the second half. A 3-pointer by Brocke Stepteau off an assist from Drew Buggs with seven seconds remaining tied the score at 70 and sent it to overtime. UCSB hit two 3-pointers early in overtime to take a 76-72 lead. The Gauchos stayed in front the rest of the way, although Hawai’i refused to give in. A 3-pointer by Jack Purchase cut the UCSB lead to 83-82 with nine seconds remaining in overtime. UCSB’s Leland King II then made one of two free throws, and Hawai’i had the final possession. Stepteau drove to the basket, but his shot attempt was blocked by UCSB’s Marcus Jackson as time expired. Mike Thomas had 27 points, 10 rebounds and four assists to lead the Warriors. He shot 8 for 13 from the field and 10 for 12 on free throws. Stepteau, who missed the previous two games with a finger injury, added 13 points and six assists. He did not start, but played 28 minutes. Leland Green added 12 points, and Gibson Johnson scored 10 on 5-for-5 shooting. Purchase contributed nine points and seven rebounds off the bench, and point guard Drew Buggs had four points and five assists. 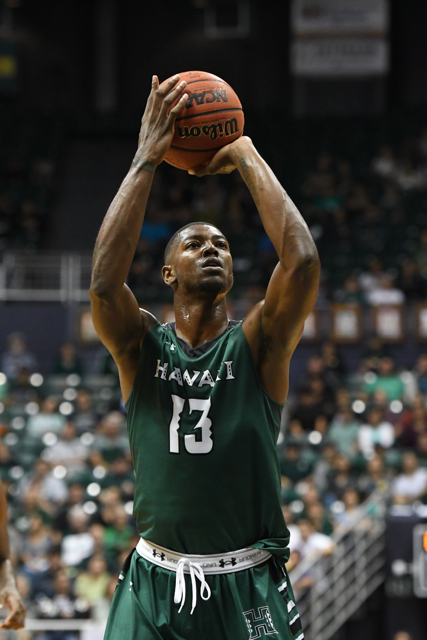 The Warriors shot a respectable 49.2 percent from the field, but UCSB shot 50 percent and out-rebounded Hawai’i, 37-28. Max Heidegger, the conference’s leading scorer, finished with 25 points (four above his average) to lead UCSB. Jalen Canty added 21 points and 10 rebounds, and King had 21 points and six rebounds. The Warriors will remain on the road for another Big West game at Cal Poly on Saturday. The Mustangs are 7-15 and 2-6 following a home win over UC Riverside on Wednesday. The Warriors beat the Mustangs, 57-45, on January 10 in Honolulu. Good performance by the team to test a good home team like UCSB to OT. I like our chances against UCSB if we have to play them in the Big West tournament. I would be more worried about Long Beach and UC Davis but lets wait and see how we do against them in the second round. Next game vs. Cal Poly is absolute must win. No team in the top 6 should lose to the bottom 3 (Cal Poly, CSUN, Riverside). Every time ucsb went on a run, the Bows scrapped back in it! The Bows can tango with anybody in this years conference. It’s going to be interesting to see them against Irvine.. they beat Long Beach at home! ^^^ More than winnable. The next 3 games are against Cal Poly, Riverside and CSUN. Those are three of the worst teams in the country and should be looked at as guarantee wins. Dickie V voice: Cupcake City Baaabeee!! !